Опубликовано 12 мая 2014 г. 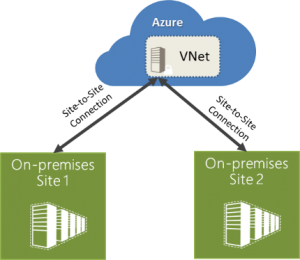 Virtual Network supports more than one site-to-site connection, so you can securely connect multiple on-premises locations with a virtual network (VNet) in Azure. Using more than one connection doesn't cost extra - you only pay for the VNet gateway uptime. For more information, visit the Virtual Network website. To get a comprehensive look at pricing, visit the Virtual Network Pricing Details website.